Discover the true beauty of North Idaho from the water aboard Lake Coeur d'Alene Cruises Fun Fleet. You’ll find many cruise choices to match your vacation or family outing, including Scenic Cruises, Sunset Dinner Cruises, St. Joe River Cruises, Brunch and Dinner Cruises or seasonal event and holiday cruises. The two-deck Lake Coeur d’Alene Cruises boats are climate-controlled and have picture windows, sound systems, and full bar service, which help create a wonderful experience on the water. Lake Coeur d’Alene is known as the Playground of the Pacific Northwest for its scenic beauty, and the rail of a cruise boat is the best place to enjoy it. Hours: Hours vary by tour. Visit website for complete information. Comments/Notes: Lake Cruises designed for seasonal experiences. Daily in the summer including sunset and 4th of July cruises. In the holiday season offering the Holiday Light Cruises or fireworks display cruises. Call for dates, times and rates. 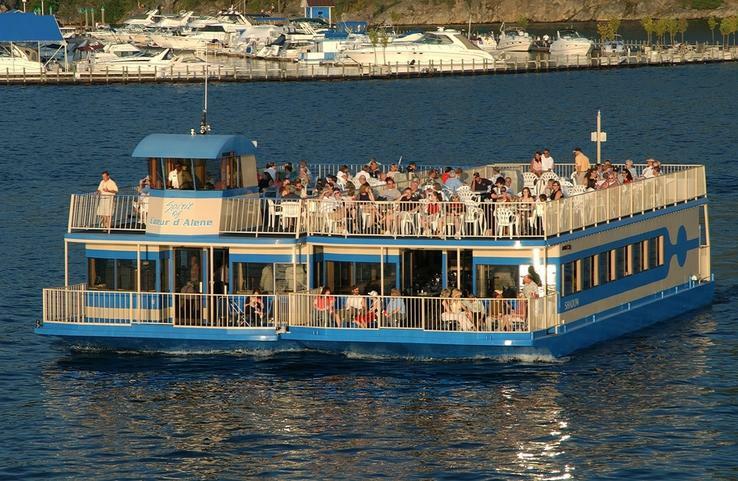 Description All Lake Coeur d’Alene Cruise Fleet boats may be chartered for parties, weddings, reunions, business functions, receptions and other special occasions. Our catering staff can assist in selecting the right on-board food and beverage service from a gourmet buffet to simple hors d’oeuvres.